When these high-tech digital art installations are incorporated into marketing events, they invite attendees to tap into their creative side. Engagements become more interactive and memorable for attendees. And what’s more, these colorful, captivating activations give attendees plenty of reasons to share on social media, resulting in additional reach and impressions for the brands that leverage them. 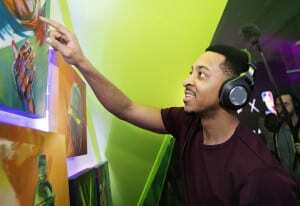 Mountain Dew’s Art x Sound exhibit featured an interactive art and beat-making station. Take Mountain Dew, which has more than once leveraged high-tech art to score with basketball fans during NBA All-Star Weekend. The brand, a unit of PepsiCo, recently hosted an interactive virtual reality art experience in downtown Toronto that had fans “painting” with Google’s Tilt Brush. Emerging local artists used the tool to create basketball-inspired 3D artwork. 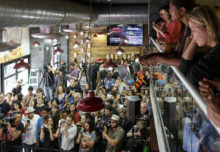 In addition, as part of Mountain Dew’s Courtside HQ experience at the New Orleans Board of Trade during NBA All-Star Weekend, creative collaborations with athletes and youth culture icons in the areas of style, music, art and technology brought the basketball lifestyle to life. Among the experiences, Art x Sound presented a gallery of 10 art pieces created by Denver-based artist Detour. Interactive touchpoints on the paintings connected to the sounds of the game and instrumental audio, allowing attendees to create music with the murals (Agency: Motive, Denver). Perrier, to help increase awareness of its wide range of sparkling flavors and introduce two new ones, activated The Perrier Flavor Studio in New York City. The Studio featured a digital art wall that showcased the original artwork of Perrier’s featured artist AKACorleone. In coloring book style, attendees used the touch screen of the art wall to fill in the color fields of the designs. Once they had finished, their artwork was printed on tote bags for a colorful memento. “The digital art wall allowed consumers to physically interact with AKACorleone’s artwork, find their own flavor inspiration and express their creative style,” says Adaora Ugokwe, senior marketing manager-experiential and p.r. at Perrier. “By translating the digital designs to the tote bag, we offered attendees a lasting takeaway.” More than 700 guests walked away with their own unique piece of art from the Studio (Agency: The Michael Alan Group, New York City). State Farm’s #HereToHelp Lounge, at music festivals such as Austin City Limits featured six rock band posters on an AR wall. When festivalgoers held a tablet over them, the artist-created posters came to life with animations that encouraged volunteerism and community give back, and provided stats about the need for help. Each poster highlighted a cause— environmental, veterans/military, animal welfare, health and wellness, hunger and homelessness and education. A click of a button took fans to State Farm’s larger initiative, neighborhoodofgood.com, where they could input their zip code to find local causes in need of help, then exit and move on to the next poster. After choosing a cause, participants had a neighborhoodofgood.com-branded photo taken and received general information about the initiative. The program was so successful fans have asked about purchasing the posters and having the artwork printed on t-shirts. “This is one of the ways we can help educate and inspire others to make a difference in their community,” says Mandy Laux, sponsorship/experiential manager at State Farm (Agency: The Marketing Arm, Dallas). One of the highlights of the 2017 Panorama music festival, held at Randall’s Island Park in New York City each July, in addition to the lineup of musicians, has to be The Lab, an interactive experience powered by HP. Described as a playground of music and technology that was housed in a 90-foot dome, The Lab featured six interactive digital art installations and a massive 360-degree virtual reality theater (Agency: Infinity Marketing Team, Culver City, CA). Among The Lab’s installations, Future Portrait offered a motion-capture art experience that transformed festivalgoers’ movements into a dynamic film animations using HP technology. While as many as eight participants at a time danced on stage, their movements created intricate particle systems that grew and evolved in real time. At the same time, two other people using HP laptops used touch gestures to alter the particle systems, influence the virtual lighting and add their own particle effects, remixing the animations as they were performed on the fly. A ceiling-mounted projector beamed the entire scene so that performers and the audience could view the film as it happened. Throughout the experience, modern dancers performed a specially designed routine while a drummer supplied the beat, thrumming and jamming as people’s physical actions became high-tech art. “When people are creating something at an interactive event they are much more excited about it, and much more engaged, because rather than feeling like they are passively experiencing something that you’ve made, they feel like you’re giving them the ability to make something themselves,” says Eliot Blanchard, creator of Future Portrait and director of PRISM, a Brooklyn-based studio. 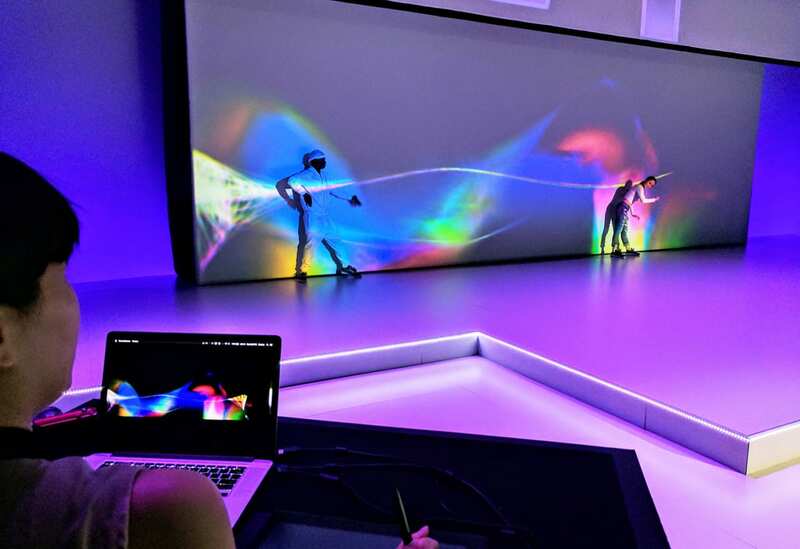 IBM Amplify began with a visual artist onstage drawing on a tablet, with her imagery projected onto a 40-foot screen. “Everything starts to play with this idea of what is data and what is not, as the image of our artist turns into an abstract pixelated image of herself and starts to look like data in real time,” says Patrick Lovejoy, founder of Elastic Shore, an entertainment company that integrates art and design with live performances, and created the live drawing experience with dancers for the opener. Drury Design Dynamics, New York City, produced the event. It looks like he could be on to something. After the opening, #IBMAmplify trended No. 1 on Twitter and activity by industry analysts reached more than 900,000 followers. Now, that’s a pretty picture any way you look at it.